Anterior Cervical Hypertrichosis. 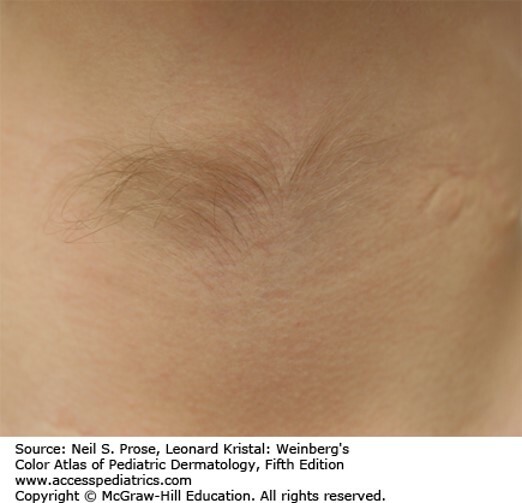 This disorder is a rare form of localized hair growth, and is characterized by a tuft of terminal hair on the anterior neck, just above the laryngeal prominence. The disorder may be congenital or acquired. Neurologic disorders, especially peripheral sensory and motor neuropathy, have been observed in a very small subset of these patients. Source: Prose NS, Kristal L. Weinberg's Color Atlas of Pediatric Dermatology, 5e; 2017.